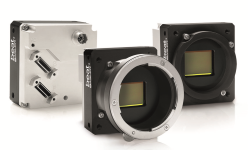 The Basler beat beA4000 has a Full Camera Link interface. It may be configured for 2, 3, 8 or 10 tap geometry, with 8, 10 or 12 bits per pixel and clock speed of up to 84 MHz. (See the manual for details.) We recommend combining this camera with the CRBW205 frame grabber for achieving maximum performance.